Thank you, Book Blogger community for bringing this article to my attention. I usually like to write a post and let it sit for a day or two. I re-read it, edit it and when I feel it is good enough, then I share it. I can't wait this time, so I apologize if this isn't that well written. I've already written and deleted and written and deleted. I have so much to say I fear that I will come off as a raving lunatic if I start spewing my indignation, my rebuttals. So, I'm going to keep this short. This is the United States of America and Mr. Scroggins is entitled to his opinion. I am also entitled to mine, which is Scroggins is re-interpreting Speak (and other books) and missing the point. Entirely. And that censorship and book banning are frightening concepts. 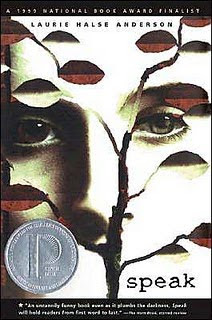 Please visit Laurie Halse Anderson's site to read what she has to say on the subject and check out this video of Anderson reciting a poem called Listen that she wrote based on responses to Speak by her readers. I've also read a lot of great posts tonight. Just click on some of the blogs in my blogroll. As my heart rate is calming down I wonder if Mr. S's opinion, article and the reaction to it, will further bring this book to the public's attention and do the exact opposite of what he wants to do. Shelve it. This article really made me so mad... If not we booklovers speak up and fight against narrow-mindedness and censorship, who else? To a totally different topic, I happened to notice that you´re reading Patient Zero by Jonathan Maberry. Wuld you like to do a guest post or review about this book or any other book written by a male author on my blog? I´m having this litte them called Urban MANtasy where I´m trying to get new insight on books by male authors. Let me know if you´re interested and if you can make the time!